If you've ever seen pictures of the beautiful San Francisco Embarcadero and waterfront, there is a good chance you saw someone driven in a Golden Gate Pedicab and looking full of joy. You've probably wondered what it is like to ride in a Pedicab. I recently had the opportunity to go on one of these tours with Golden Gate Pedicab. A Pedicab is a two seat, open air cab pulled by a bike. 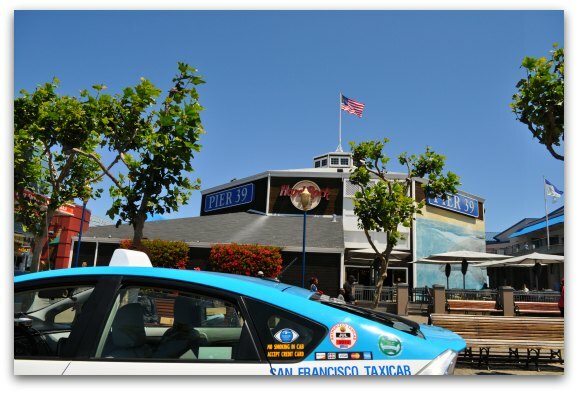 They are a fun and exciting way to easily get around the SF waterfront or tour the local neighborhoods such as Downtown, Fisherman's Wharf or Chinatown. However, this is not just transportation. It is a fully guided tour and entertainment package all rolled up into one! In fact, my guide, Oskar, refers to his job as "transportainment." I can't imagine a better way to see San Francisco. My journey started at the Ferry Building. This is where many people start their tour or Pedicab ride. The Ferry Building is a major attraction in San Francisco with lots of great places to eat, hang out and people watch. Oskar and I met up here and started the tour. I immediately noticed how smooth the ride is in this vehicle. Each cab has shocks, which reduces the bumps along the way. The seats are also very comfortable and easily fit two adults. As we made our way north on the Embarcadero, Oskar provided information about the attractions and the history of the local area. As I listened, I also had the chance to take some pictures. We rode past the the Exploratorium, which has several cool exhibits and pieces of artwork outside. 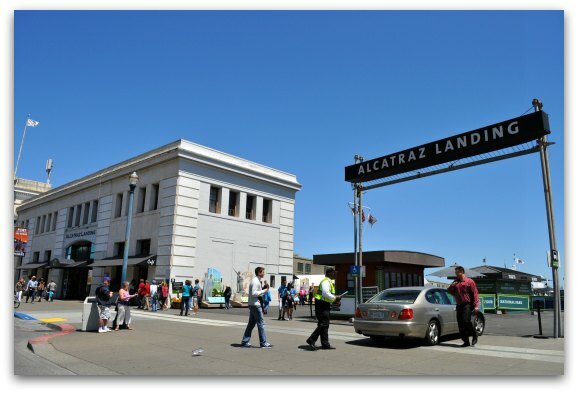 We then rode past Pier 33 (Alcatraz Landing), where the ferries leave for the island. It only took us about 10 minutes to get here from the Ferry Building and it's a popular stop for the Golden Gate Pedicab drivers. Compare this to driving, which can take 30 minutes in traffic and add the stress, parking and lack of picture taking opportunities. The Pedicab wins every time! Five enjoyable minutes later, we cruised past Pier 39. This is the popular shopping and dining area in Fisherman's Wharf. 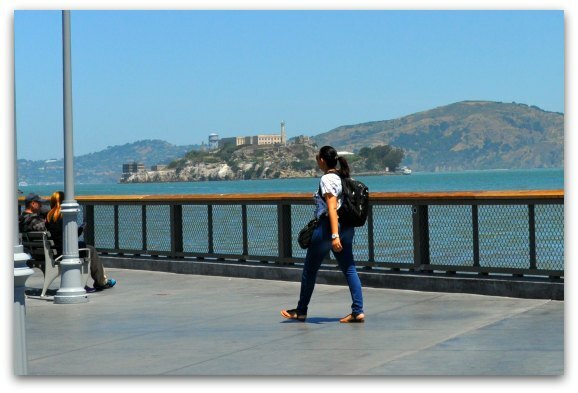 From there, we made our way past Fish Alley (famous for its fresh seafood stands - you must stop here at least once during your visit), Pier 41 and along the SF waterfront. The views from the pedicab were fantastic. I was even able to sneak in a picture of Alcatraz from my seat. Even though we didn't stop on my tour, the drivers are happy to pull over for you to take photos along the way. Just let them know and they’ll find a safe place to stop. Heck, they will even take a picture of you! Like most journeys and adventures, it had to end. It took less than 20 minutes for my tour. I estimate it would be about 30 minutes or so if you stop for photo opportunities, as there are so many! My first tour on Golden Gate Pedicab was an absolute joy. It is another way to see the city, especially if you are tired of walking around and need a break. Add in the chance to take memorable pictures and you'll find it is a great deal! Here are a few other things to note about these rides. 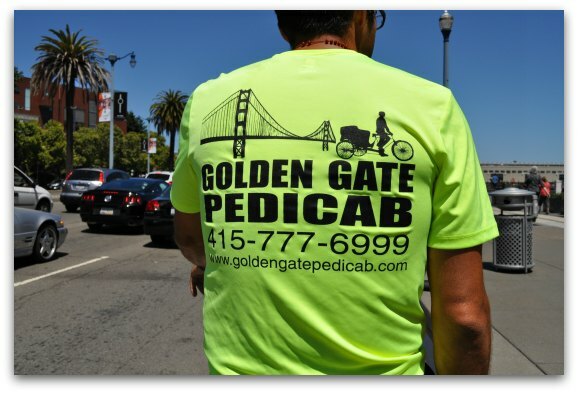 Flexible Service & Routes: The team at Golden Gate Pedicabs wants to make sure you get your money's worth and enjoy your experience. They are flexible on their routes and willing to take you most places in the city (anywhere they can legally ride). You can also add onto your tour after you begin. If you are having a great time, tell them you want to continue and they will take you to additional places. They can also meet your budget. If you only have $20, they will find the best route for your money. Stay Dry on Rainy Days: No need to worry on rainy days. All cabs have the ability to add a canvas covering. This way, you can still enjoy your journey while staying dry. Bring Your Bags Along: Do you need some additional space to store the goodies you picked up along the way? No problem. Each cab has a storage area below the seats for shopping bags and other small items. Warm Up on Cool Nights: The San Francisco nights are always a little chilly. Stay warm with courtesy blankets that are always on board. Take a Narrated or Unnarrated Trip: You can choose to use the Pedicab as a guided tour or just a ride to your next destination. You decide. Just let your driver know which one you prefer. 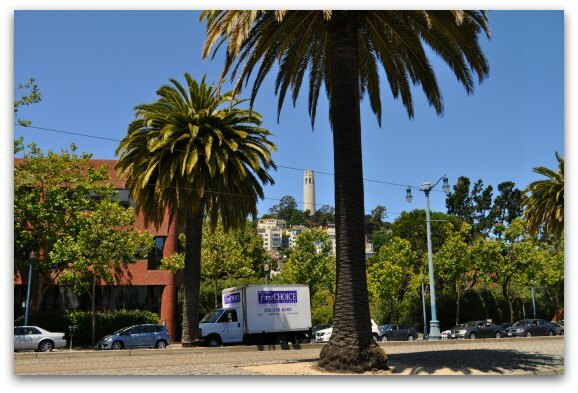 Get Recommendations: Your driver knows San Francisco. If you have additional questions or want recommendations for the best places to eat, shop or grab a drink, just ask. They know the city better than anyone does and can point you in the right direction. Here are some of the most common requests. All posted Golden Gate Pedicab fares are to/from the Ferry Building. The prices include up to two people. You can either book in advance for your Pedicab tour or find one near the Ferry Building, Alcatraz Landing or in Fisherman's Wharf. If you book in advance, you can arrange for a meeting place that works best for you. They request only 24 hours' notice when booking in advance. Find more details on their site to book your tour in advance. You can use either cash or credit card as payment. The easiest option when you pick one up on the street is cash. They do accept credit cards, but need to call back to their office in order to run the card. This can take some time, so I recommend bringing along cash for your tour. Tipping Your Driver: Tipping is the norm in America. The average tip is around 15% and if you had an amazing tour, then maybe increase your tip to around 20%. Do you have a special event coming up or are you interested in a unique San Francisco experience? 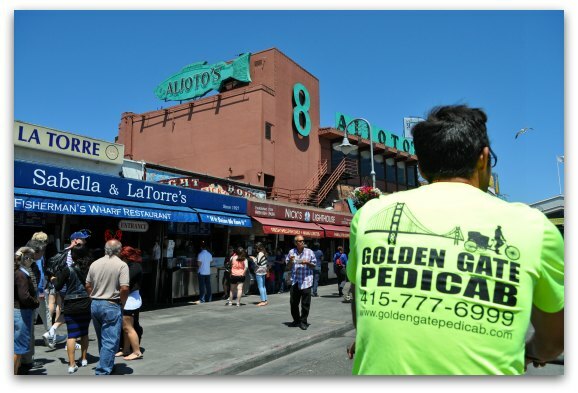 Here are just a few of the types of events Golden Gate Pedicab has done in the past. Weddings: Use Golden Gate Pedicab for just the bride and groom or rent a few to move your wedding party around the city. Pub Crawls: Cruise from bar to bar without having to wait for a cab or the bus. 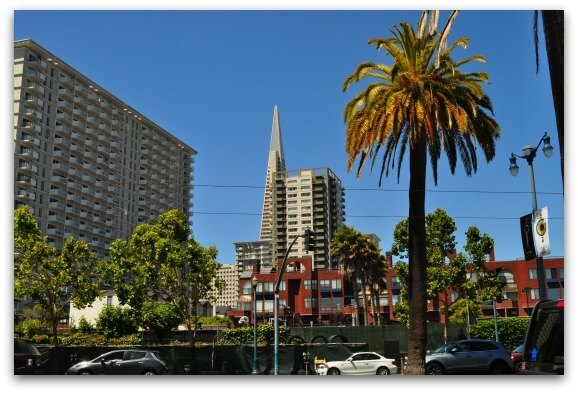 Cruise Shore Excursions: Do you have a limited amount of time in SF? Call ahead and your ride will be waiting for you the minute you get off the ship. Romantic Dates: With only two people on board, the Pedicab is the perfect solution for a unique night out on the town. Ride around the city or use them to get you to your favorite restaurant or event. Scavenger Hunts: Create teams of two and race around the city finding clues and prizes. Use it for birthdays, bachelorette parties or even your next corporate event. Outside SF: Golden Gate Pedicab will also support events outside of the city in the East, North or South bay areas.